Ellagee - Holiday Sparkle Trio - Polish Etc. Today, I have a fun little holiday trio from Ellagee to share with you. Just in time for Black Friday sales, too. In fact, Ellagee will be having a nice little Black Friday sale and an exclusive, limited release polish for those that order this weekend. Let's take a look at these fun sparklers! Elegant - A deep royal purple jelly with pink/purple shifting shimmer and holographic flakies. This is a gorgeous shade of purple that works year round. It is definitely on the cooler side of purple. Great formula with a smooth and squishy application. This is two coats with top coat here. Glamorous - A deep cranberry pink jelly with purple shifting shimmer and holographic flakies. Again, great formula here. The flakies are less dense in this shade compared to the other two in the trio. I really like this deeper shade of pink for the holidays. I am showing you two coats with glossy top coat here. Captivating - A deep but bright cobalt blue jelly with blue/green shifting shimmer and holographic flakies. The color of this polish is blue but there is a hint of teal green from the shimmer. It is great for all year! Very nice squishy formula and smooth application. I have two coats and glossy top coat on for these photos. For an extra treat, Ellagee will have a special polish available for the weekend only. Doorbuster 2017 - A blackened plum base with linear holographic shimmer and pink/purple shimmer. The base color is very dark. In low lighting, it will look black but in other lighting it looks purple or even brown. I dig it! The pinky shimmer really adds a nice touch. I am showing you two coats with glossy top coat here. 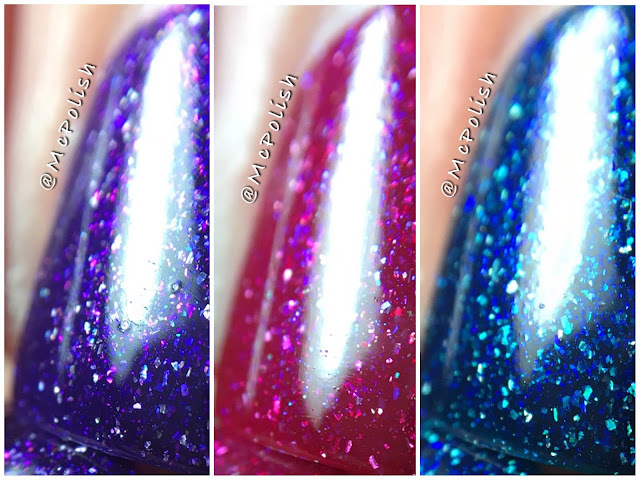 The Holiday Sparkle Trio will release on Black Friday which is 11/25. The sale that Ellagee has going on over the weekend is a nice one! From 12am CST on 11/25 until 11:59pm on 11/27 (Black Friday through Cyber Monday), you can use the code DOORBUSTER at checkout to get 20% off of your order. What a steal! Custom colors and 24k Gold Top Coat are not included in the sale. The Doorbuster 2017 polish will also only be available for purchase during the sale. So get it while you can! These are so pretty! :) I really like this squishy holo flakie finish.